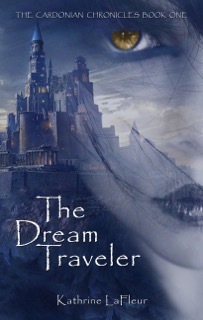 YA fantasy author Kathrine LaFleur joins me today to chat about The Dream Traveler: The Cardonian Chronicles Book One. Kathrine LaFleur grew up in the San Francisco Bay Area. Lurking beneath the stairs where her grandmother kept a small, dusty library is one of her best childhood memories. She has many years of experience as an elementary school educator and enjoys nurturing a love of reading and writing in her students. She has written books for a range of ages from four years to young adult. She hopes that her writing will empower readers to value their unique qualities and see their own potential to transform obstacles into opportunities to triumph. She currently lives in Oakland, CA where she joyfully pursues her passion of writing and publishing books. Welcome, Kathrine. Please tell us about your current release. Four hundred years ago everyone in Cardonia Gifted with Telepathy was exiled to the Badlands, a stretch of unforgiving, unlivable desert. Now the spirits of those who were so cruelly and unjustly punished have invaded Cardonia, and they are out for revenge. With no warning, Raven and her family are forced to leave home and join their fellow Cardonians on a journey to the kingdom’s shielded core, four mountain ranges each encircling a protected space. For once she has bigger worries than the fact that she is the only one her age still lacking a Gift. When her Gift does emerge, it sets Raven on a course of action that can either save Cardonia or cause her to lose everything she holds dear. I’ve always been fascinated by dreams, and wanted to write a story about two people who were connected through their dreams. This book turned out to be so much more than that, which is something I love about writing – the surprise and discovery of what comes out when you open up and explore different possibilities. The birds were restless, even for birds. Five of them twittered and fluttered among the old oak’s leaves, barely settling on one branch before lifting up again and hopping to another. This made the pigs who lived in the pen below the oak tree nervous, and Barrett never doubted the word of a pig. After dumping the slops, which they ignored, into their trough, Barrett knelt and put his hands on either side of Mama’s face. Mama was a large pig with black and white markings across her broad back. She had lived on Baron Tumero’s farm for eleven years, giving many fine litters during her fertile years, and each year Barrett had mourned with her when her offspring had grown fat enough to be taken to slaughter. As an unspoken rule, those with the Gift of Animal Speaking were strictly vegetarian. Barrett closed his eyes and allowed Mama’s knowing to enter his awareness. She was restless, wanting to find a way out of the pen, but she gave no specific reason. Barrett thanked Mama with a gentle pat and rose, trying to tune into the hysterical chirping of the birds, not an easy task given his own racing heart and sudden rising of anxiety in his center. Birds had never been his strong suit. He needed physical contact to get a clear message, and they were so flighty, barely able to piece two solid ideas together. A sense of sinister darkness overcame his mind. He caught fragmented flashes of shadowy wisps, flailing arms, figures clawing at their own faces, others raging, striking violent blows, frenzied bloodlust fed even more by anguished screams. The birds themselves broke the connection by taking flight. Barrett opened the pigpen gate and left it open. Something is very wrong, he told Mama. I might have to leave for a while. He made his way to the cottage, striding quickly at first, then running, pausing only to open more gates on the way: the chicken coop, the horses’ enclosure, the rabbit pen. “Violet, Raven!” he shouted. The girls were inside, cleaning up after lunch. Raven’s slight form appeared in the doorway, a grey rag in her hand. A rider came from the south then, and the ground was rattled by the horse’s hooves. The rider was young, maybe twenty, Barrett guessed, and his face was panicked, pale. Barrett changed course to run towards the horseman. The horse’s golden sides foamed with sweat. It danced side to side, unable to still its body after such a frantic gallop. The man took another large breath and nodded, then shook his head. “They’re all infected; I’ve never seen so much blood.” The rider’s face paled even more. He leaned his torso over to one side, keeping steady with an outstretched hand on his horse’s mane, and was sick on the path. “Dad!” Raven called to him from the house and began to run forward. “Stay there,” he commanded, holding out one hand. She stomped her foot and whirled back into the house. Barrett noticed there were bruises on one side of the man’s face, and a weeping cut on one hand looked as though it traveled upwards beneath his sleeve. Barrett was silent for a moment, torn between ensuring the safety of his daughters and desperate hope for Yadira. He glanced toward the cottage and saw his elder daughter, Violet, watching him, worried. He turned back to the rider and gave a slight nod. He was already unfastening the rider’s saddle and whistling a beckoning call to Bella. The rider staggered to the ground. “If she’ll let me saddle her, you should go,” the man said. Barrett nodded and turned to Bella, who arrived with her neck arched, already sensing trouble. Barrett pulled her head low and whispered into her ear. Bella moved to stand beside the rider, who handed the reins of his own horse to Barrett. Barrett nodded toward the house on the far end of the field. Even from this distance its size was notable, spreading across space enough for ten of his own small cottage. “I’ll inform the baron and household there. Good luck to you and thank you,” he told the man. Barrett nodded and ran to the cottage where both his daughters now stood in the doorway. Book three of the Cardonian Chronicles is in the works, and I hope to it release this summer. I’m excited to share the growth of certain characters from the first two books and introduce new ones. I was a closet writer until my late twenties, when I finally faced fears of failure, made a commitment to writing, and learned to call myself a writer, even in front of other people. I do not write full time… yet! Currently I also teach elementary school. In between teaching and tending to a household that includes three dogs I take about an hour and a half at a local café to enjoy some very quiet, peaceful reading and writing time. I have a thing for pens; I’m extremely picky about what kind of pen I use. I tried out several different kinds and finally chose a Parker refillable because I love their gel ink. The pen itself, though, doesn’t have the comfy grip I was looking for, so I keep a squishy pencil grip on it. I also have conversations with my characters, but I have a feeling both of those quirks could be pretty common for other writers, too. At least, I hope so! I wanted to be a veterinarian, a dancer, and an author. Cardonia is a place where everyone has a special supernatural Gift, and I’m always curious to know what Gift people would have if they lived there. I think I’d either be an Empath, Dream Traveler, or Animal Speaker. I’d like to invite readers to check out the Cardonian Gifts on my website and share with me on Facebook or Twitter which best fits them, or suggest one that isn’t listed. Thank you for being here today, Kathrine.